Devils Delight Video Slot Guide & Review - Casino Answers! Devil’s Delight is a 5-reel, 20-line video slot developed by Net Entertainment, featuring a wild symbol, expanding wilds, multipliers, two free spins features and a bonus game. You can play the Devil’s Delight video slot at Bovada. Coin values on the Devil’s Delight slot machine are $0.02, $0.05, $0.10, $0.20 and $0.50. You can bet 1-10 coins (or “Bet Levels”) at 1-20 paylines. The lowest possible bet on the Devil’s Delight slot game is a penny per spin up to the highest total bet possible of $100 per spin. You can manually skill stop spins on the Devil’s Delight video slot by hitting the Spin button in the midst of a spin. To play Devil’s Delight at the highest bet level with all 20 lines enabled, hit the “Bet Max” button. For any other wager, you can simply press the Spin button (located in the middle of the game buttons). The highest paying symbol on the Devil’s Delight slot game is the She-Devil symbol. If 5 She-Devil symbols land on the reels of the video slot, you will win the 4000 coin top jackpot. Other high paying symbols on the Devil’s Delight online slot are Gluttony (2000 coins), Lust (1500 coins) and Sloth (1000 coins). The Devil is the wild symbol on the Devil’s Delight slot machine. It will substitute for all symbols except for the scatter and bonus symbol. When the wild symbol appears on reels 2, 3 or 4, it will become an expanding wild and cover the entire reel. The expanding wild can create lots of new winning combinations when you play Devil’s Delight at Bovada. When 3 or more Scattered Pentagram symbols appear on the reels, you will trigger the free spins feature. You will get to choose one of the symbols that triggered the feature that will reveal the amount of free spins you will receive along with a multiplier (from 1-5X). When 2 scatter symbols are hit during the free spins feature, you will get more free spins or an increased multiplier. Bonus game winnings are not affected by the multiplier. When the Soul-O-Meter below the reels reaches 15 souls and fills up, you will be awarded 10 Sin Spins. The more you bet in Devil’s Delight, the more you will win from the Sin Spins feature. Winning combinations and payouts are made according to the Paytable. Payline wins are multiplied by the bet per payline. Wild symbol will substitute for all symbols except scatter and bonus symbols. Wild symbol on reels 2, 3 or 4 expands to cover the entire reel when completing winning paylines. Only the highest win per active payline is paid. Payline wins pay if in succession from left to right. Simultaneous wins on different paylines are added. Devil’s Delight has an autoplay mode that can be opened up by hitting the “Auto” button. You can play 10, 25, 50, 75, 100, 250, 500, 750 or 1000 autoplay spins at a time. In the advanced settings, you can set Devil’s Delight autoplay mode to stop on any win, if free spins is triggered, if the jackpot is won, if a single win exceeds (any amount you input) and if cash increases/decreases by (any amount you input). You can stop the autoplay mode at anytime on the Devil’s Delight slot game. Devil’s Delight has a great Halloween theme, a more challenging bonus game than most, not one but two free spins features and some decent payouts (although it lacks the one really giant top payout). To play the Devil’s Delight video slot, sign up and make a deposit today at Bovada! 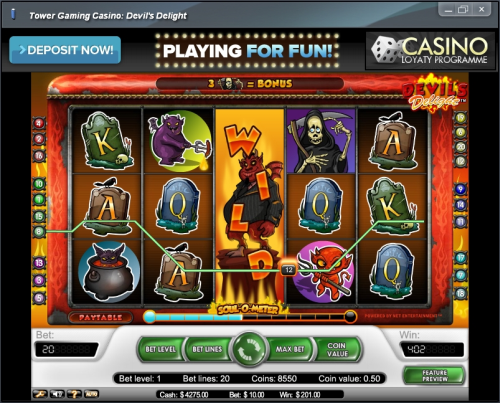 Can I play a free Flash game of the Devil’s Delight online slot? 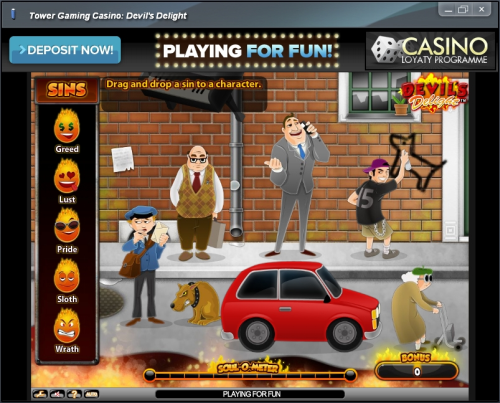 You can play a Flash game of the Devil’s Delight video slot right here at Casino Answers! You can find the Devil’s Delight Flash game in our Flash games section. If you come across any difficulties playing the Devil’s Delight Flash game, make sure you have the latest version of Adobe Flash Player installed on your computer. Can players from the United States play Devil’s Delight for real money? American players cannot play the Devil’s Delight slot game for real money at this time. For a couple of Halloween video slots you can play, you can check out Scary Rich and Scary Rich 2 at Rockbet Casino or read our Rockbet Review. How do I get Sin Spins on the Devil’s Delight video slot? Sin Spins are activated once you have collected 15 souls from the Soul Reaper bonus game on Devil’s Delight. This is done by correctly matching one of the various characters to the sins listed on the left. To match the sin to a character, simply drag and drop that sin over top of the desired character. Where can I read more Halloween slot reviews? If you want to read more Halloween-themed slot game reviews, please read our list of Halloween slots. What are the correct answers for the Devils Delight Soul Reaper bonus game? Unfortunately, the answers are not static on the Soul Reaper bonus game, meaning they’re likely to change every time you play it. We’d love to tell you how to win every time, but it’s not quite that simple. Now we all know your sin – Cheat!